It’s been a while since I last wrote here! Over three years to be precise… I’m now 2900+ miles away from where I last posted from and in a very different place in my life. Fortunately, I still love words, and I want to share a few links I have found lately that might be interesting to linguistics people. 50 Noted Americanisms – Included here are “fanny pack”, “transportation”, and the letter “zee” (instead of “zed”)! I was laughing by the end. I was recently in Japan and was very frustrated that I was essentially illiterate. It’s very weird to not be able to read anything. The image above depicts the origins of a few Japanese kanji, a set of characters that stand for words. 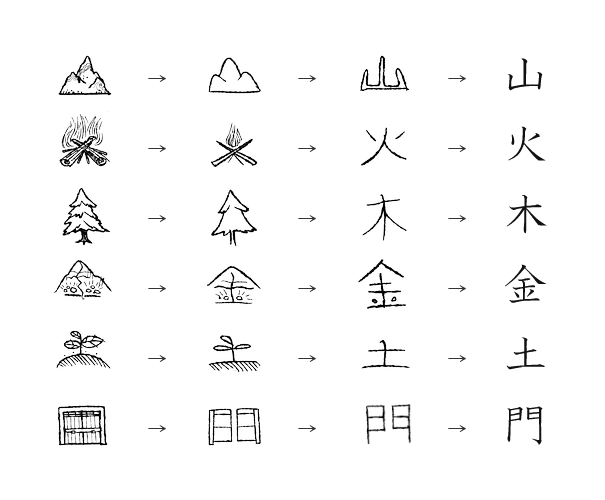 In order, these kanji mean: mountain (yama), fire (ka), tree (boku/moku), money/gold/metal (kin), soil (do/to), and gate (mon). Here is a whole list of kanji. That’s all for now. I’m holed up at home because of Hurricane Sandy. Here in NYC (that’s where I live now), public transportation has been shut down until further notice. Do let me know if you have any linguistics links to share! Post them below.